Writing is fun. It really is, I enjoy almost everything about it, even including the hard parts like networking and promoting. One of the best experiences I've had as a writer is watching my daughter when she is writing. Writing Sons of the King with Olivia is an incredible experience. She is very professional and has definite ideas about the story. Trestle Press has given us a great opportunity, for which we are both thankful. Episode Two centers on the annual religious celebration known as the Nine Days of Creation. The sons of the King experience all of the food, fun and games they can handle. Unfortunately, a shocking event interrupts their festivities. Hopefully by now you have had a chance to read the latest story from the One series. For the Love of All is written by a best-selling, award-winning author along with a counselor who happens to be a talented author, as well as an outdoor enthusiast. MM: What inspired you to write this story? Scott: A chance meeting that turned out not to be chance at all. In the summer of 2011, during a silent mediation, walking, and writing retreat in Taos, New Mexico, I met a traveler who seemed to be on a journey similar to mine. Brought together by forces beyond both of us, we discovered a connection of remarkable depth and intimacy. What followed was an intense recognition of each other that was so stark and clear, even though we had never met before – at least not in this lifetime. Almost immediately, we began to realize a series of synchronicities so profound and frequent that they were undeniable, pointing us toward relationship, collaboration in writing, and united purpose in matters close to our hearts. Melissa: Scott said it so perfectly. Everything he said applies for me, as well. MM: So the river scene actually becomes a metaphor for your philosophy. I can see how you were brought together by currents beyond your control. Writing such a personal story could not be easy. I’m sure you’ve had plenty of practice. How long have you been writing? Scott: I’ve been writing since I was a kid. My mother used to have this massive Sperry Rand electric typewriter. I remember at the age of eight or nine sitting down in the middle of summer behind that awesome humming cream-colored machine. It would spit out print as fast as I could poke it in. I loved it! It was like a hot-rod I could rev up, and it would take me places while I wrote. 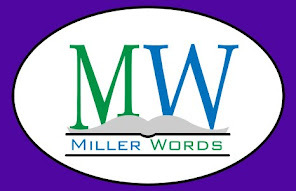 During summer vacations, (my middle school sabbaticals) when every other kid was outside playing in the sunshine and fresh air, I’d be in my room hunkered down behind my wondrous word machine, clacking away, trying to get the keyboard to keep up with my ideas. I’d write research papers and essays about anything and everything. My brother and sister thought I was nuts. But I remember the exhilaration of being behind that amazing machine for hours, turning out page after page, completely energized by the experience of inking my thoughts on paper. That was the real beginning. Melissa: It really has happened in stages. I think I've always been writing in my head. I can remember making up dialogue while standing in front of the mirror blow drying my hair as a kid. I didn't really know what I was doing or why, but it was part of what fed into my writing later, and it was the earliest stage. Thankfully, I didn’t tell anyone about the “voices,” so they didn’t lock me up! I started actually writing in my early twenties, and that was the second stage. I enjoyed it, but wasn't serious about it, and I stopped for a long time as I focused on other things. It never felt right to not be writing, but I wasn't very self-aware yet, and I wasn't sure what was missing. I began again when I was in my thirties, and that's when I got serious about it. In the past I’d always grappled with whether or not I was spending my time wisely by sitting around making things up. I just felt like there were better contributions I could make. I felt that writing was frivolous and a type of self-indulgence. In my thirties, however, I began to view writing differently and to really understand the kinds of contributions literature has made and can continue to make to our world. It was then that I finally allowed myself to become immersed in what I should have been doing all along. Now I absolutely cannot imagine my life without writing. It has become an integral part of who I am. MM: Both of you are deeply immersed in writing. Speaking from experience, an author can develop interesting habits, some might say, eccentricities. What is one of yours that you would like to reveal? Scott: I like writing early in the morning or late at night. It’s a habit or at least a pattern that my best writing emerges late at night, between midnight and two in the morning. Although I write at various points throughout the day, when midnight rolls around, I usually know something fun’s about to happen. Melissa: Only one eccentricity? I’m feeling a little hemmed in by this. Ha ha. Okay, when I’m really rolling, I somehow end up crouched in my chair like a frog that’s about to leap, or some sort of deranged, keyboard-happy yogi—feet flat on the chair, rear-end resting on my heels or suspended, forearms on my knees, hands on the keyboard. The position is called Malasana or Garland Pose. I don’t know how I get into this position, but I do, instinctively, and I love it because it’s a pose of extreme energy, alertness, and readiness. I feel that I’m open to receive and poised to deliver. Obviously I don’t stay this way very long because, quite frankly, it’s not very comfortable. But when I’m in the most intense part of any writing project, I instinctively end up sitting like this for at least a little while. MM: Melissa’s posing leads me into another topic. In your story, you meet at a type of spiritual retreat. In some faiths, people go to church, in others, they meditate. What more can you tell us about your faith that we don’t get from the story? Scott: I’m always struck by phenomenal examples of human-kind that cross my path quite unexpectedly. This has deepened my faith in people in general and the universe’s ability to constantly surprise me with people of incredible quality and experiences beyond my wildest imaginings. Over time, I’ve developed greater faith in the fact that love is the most powerful force in the universe. I’ve been fortunate enough to have witnessed how acts of love and courage beyond the norm can transform lives of chaos into lives of peacefulness, meaning, and order. One final factor that guides my faith is that I’ve become aware of a “Flow” in life, an invisible stream of energy and circumstance that runs along like a powerful silent river. I’ve experienced being in and out of this flow at different times in my life. Events and relationships move incredibly smoothly as if they were traveling gently along in the same serene river of energy. A deepening awareness of this flow reinforces my faith in a loving and orderly universe. Melissa: I don’t know if there is a word for what I am. Agnostic means you’re uncertain but thoughtfully considering. Atheistic means you don’t believe in a deity. I believe it all. I believe that Buddha attained enlightenment. I believe that Jesus is the son of God and came as our savior. I believe that Ganesha is a remover of obstacles and Guanyin is a goddess of compassion. I believe that shamans communicate with the spirit world. When you look at the common denominator among religions – to do to others as you would have done to yourself – the details of the different faiths don’t seem to matter as much, and it becomes easy to believe in their mutual relevance and that they can peacefully coexist. MM: And that is why you two fit so perfectly with the One series. It is exactly the idea that regardless of your religion or label, we are all travelling on the same path, riding in the same vehicle floating through space. Sorry, I got carried away. Back on topic, who are some of your writing influences that maybe led you to this way of believing? Scott: Among the most prominent would be Victor Frankl, Natalie Goldberg, Imaculee Ilibagiza W.O Mitchell, Pablo Neruda, and Og Mandino. Victor Frankl is possibly one of the most spiritually stirring influences in my life. Man’s Search for Meaning has been a well-spring of hope and inspiration for me both personally and professionally. I have studied formally with Natalie Goldberg for a few years now. Her pairing of Zen meditation and writing practice has been influential in the birth and development of my writing. Imaculee Ilibagiza touched me deeply with her account of surviving the Rwandan holocaust in Left to Tell, and shaped my outlook on people, the unbreakable human spirit and their indiminishable capacity to love under all circumstances. W.O. Mitchell affirmed for me the connectedness of all people and living things to each other and our connection to the earth. He was also one of the pioneers of freefall writing, another of my entry points into the world of writing and creative expression. Finally, I absolutely love everything Og Mandino has ever written, especially The Greatest Salesman in the World. And I can’t get enough of the poetry of Pablo Neruda. Melissa: There are so many authors and works that I love. I adore T.S. Eliot, Homer, Hermann Hesse, Elizabeth Cunningham, Rainer Maria Rilke, Henry David Thoreau, Fyodor Dostoevsky, Pablo Neruda, Rumi, Shakespeare, Walt Whitman, Dorothy Bryant, T. Coraghessan Boyle, Rabindranath Tagore, Chaucer. I loved One Hundred Years of Solitude by Marquez, Wild Mind by Natalie Goldberg. In addition to Rilke’s poetry, I’m nuts about his letters, and Vincent Van Gogh’s letters too. I’ve been influenced by Jorge Luis Borges’ Labyrinths, Italo Calvino’s Cosmicomics, Anne Sexton’s The Awful Rowing Towards God, writings by Jonathan Swift, Franz Kafka, Sophocles, Cervantes, Emily Dickinson, James Redfield, and Wu Cheng'en. I’ve also been inspired by The Wizard of Oz, Alice in Wonderland, and other children’s classics. I could go on for pages. I love to read, and reading is a huge foundation for my own writing. Let me just say that anything I read that is crafted with some authenticity of voice or spirit, even if it is very different from my own style and themes, is likely to inspire me in some way. MM: My head is spinning. I recognize (and have read) more than a few of those. That is an impressive list and definitely grounds for much inspiration. It seems that all you do is read or write. I bet you do not own a television. Let’s jump from writing influences to spiritual influences. Go ahead, hit me with another impressive list. Scott: It’s funny, but I’m having trouble separating my writing and spiritual influences. Among the greatest - Og Mandino, James Allen, Eckhart Tolle, Paulo Coehlo, Mabel Dodge Luhan, Jesus and Bhudda. The impact of writers like James Allen, Og Mandino and Coehlo have had on me in terms of the power of thought and love and in striving for a life of service and authenticity is profound. Tolle informs my journey encouraging me to experience the miracle of being present. Mabel Dodge Luhan is a spirit guide for me, leading and informing me as events in my life unfold. I love the examples of Jesus and Buddha in terms of peacefulness and unconditional love, compassion and acceptance for all of humanity. As well I’d have to include a number of dear departed friends and relatives including a great Uncle from Norway, Jon O. Botun who will forever connect me to the spirituality of the outdoors. Melissa: I’m loving these opportunities to pay homage. Again, I could go on for pages. I’ve been profoundly influenced by the teachings of Jesus in the New Testament; Tenzin Gyatso, the 14th Dalai Lama; and Thích Nhất Hạnh the Buddhist monk who was nominated for the Nobel Peace prize by Martin Luther King, Jr. All of them teach love. I’ve also been inspired by writers and works such as The Bhagavad Gītā, The Tao, Sogyal Rinpoche’s The Tibetan Book of Living and Dying, Many Mansions by Gina Cerminera, The Jātakas, Viktor Fankl’s Man’s Search for Meaning, Julian of Norwich, St. Thomas Aquinas, Natalie Goldberg, Elisabeth Kübler-Ross, Huston Smith, Deepak Chopra, Edgar Cayce, Mabel Dodge Luhan, Thomas Moore, Eckhart Tolle, Robert Monroe, Rūmī, Carl Jung, Hildegard of Bingen, and Joseph Campbell. I know the list is eclectic, but the links are pretty obvious: love, mysticism, and awareness. MM: I see a pattern there. We writers tend to be emotionally connected to our words. It’s that emotionality and spirituality that keeps us writing. I imagine that a painter or sculptor could say the same of their medium. Love, Art, Spirituality are all absolutely connected. And before we get to heavy, let’s back up to your bios. What is something about you that typically doesn’t make it onto the back flap of the dust cover? Scott: If I were able to write and trail-run simultaneously, I’d be a very happy man. There’s something magical that happens to me when I run. And when I am trail running, the experience is ultimately more enhanced. I get to a meditative place, probably because of the breathing, the rhythmic nature of my feet dancing over the trails and the influence of my natural surroundings. The spirituality of nature has always spoken to me in a clear voice. I get into a place of relaxed yet intense focus. This combination of things sends my “inspiration-meter” over the top. I get all sorts of beautiful creative visions and inspiration for writing and the work I do, as well as messages from spiritual guides. It’s as much pure meditation as is my sitting practice. The ideas and images flow to me with ease, filling up my vision as I run. It’s a powerful experience and a precious gift that I’ve learned to honor and value in my development as a writer and a human being. Melissa: I’m a complete sucker for animals. I’m always picking things up on the side of the road – usually dogs and cats – but I’ve had foxes, raccoons, possums, and other types of critters. My daughter says if it weren’t for Scott, I’d be the crazy cat lady. I even tried to get a fawn into my car a few months ago because the land it lived on had been cleared for a hideous strip mall, the mom had already been hit by a car, and I figured it had nowhere to go. Right now I have four cats, but that number is always changing. Scott: I’m in the process of writing a collection of short stories about intimate partnerships and connectedness. Melissa: I’m currently putting together a book based on the radio interview program, Tiferet Talk, which I host for the literary journal Tiferet. The publisher, Donna Baier Stein, has started a press associated with the journal, and the first book will be a compilation of the first year of Tiferet Talk interviews. It’s filled with insight and wisdom about spirituality and writing. I was fortunate enough to interview people such as Julia Cameron, Robert Pinsky, Marc Allen, and Jeffrey Davis. They had so much to share. I can’t wait to see it all collected together as one book! MM: I have two unusual questions that I like to end with. When you move on from here, if you get the opportunity to speak to your supreme being, what’s the one thing you have to ask? Melissa: How may I serve you and my fellow beings? MM: Very nice. Lastly, if you were a flavor of ice cream, what would it be? Scott: Most definitely I would be “Infinitely Chocolate.” Or at least, I aspire to be. I think about the myriad variations of chocolate and equate that with all the experiences I want to taste within this lifetime. It’s about living deeply, giving and receiving, growing and developing in love and acceptance. There’s also the mystery and intrigue of chocolate, with its range of lightness and darkness, its sense of duality, and, of course, the wonderful mood-enhancing chemistry it produces in the body and brain. These are things that, until I evolve into my ‘chocolate-ness,’ I currently achieve as a mortal, through practicing connection with people, meditating, running, and writing. Melissa: One time in New York I ate at this little hole-in-the-wall Thai restaurant, which, so sadly, I cannot remember the name of. They served me a dessert of red bean ice cream drizzled with rose water and garnished with basil leaves and saffron threads. The ice cream itself was humble, created from a modest bean, but it was dressed so beautifully, and the whole concoction was a delicate interplay of complexity and simplicity. I would be that. MM: Thank you both for taking the time to talk with me. 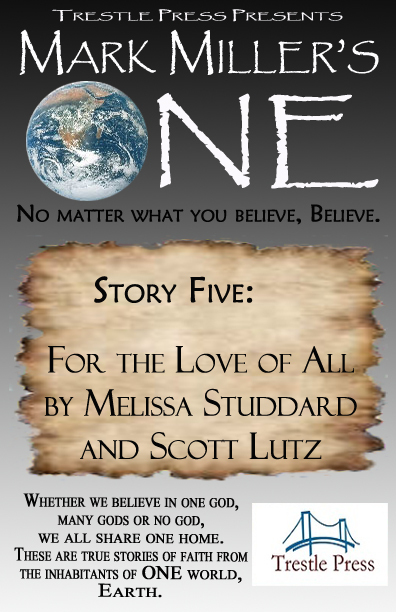 If anybody has not read For the Love of All, by Melissa and Scott, it is available from Trestle Press in a variety of eBook formats and sells for only 99 cents. Keep in mind, this is story #5, which means there are four other fantastic stories waiting for you. 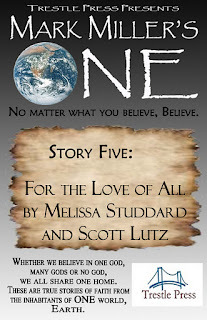 For the Love of All: Story Five from Melissa Studdard, best-selling author of Six Weeks to Yehidah, and Scott Lutz, a behavioral and teen counselor, tells an incredible tale of finding love where love was never expected. The romantically linked pair of authors shares how they almost never met and how their spirituality created a bond that spanned a continent. 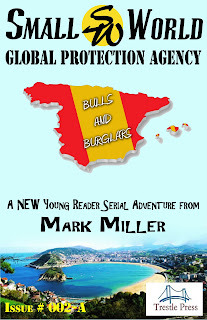 SWGPA #002-A: Josh and Madison are sent to Spain to investigate the world’s most notorious cat burglar, La Pantera. 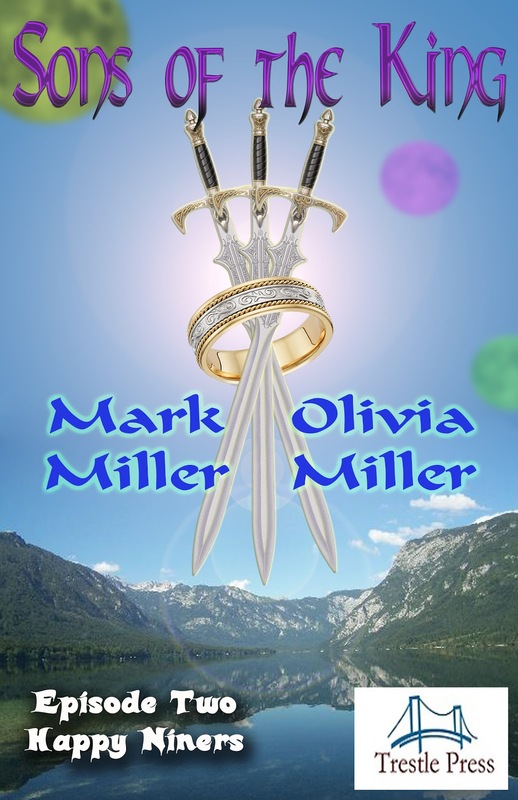 There, they team up with Special Agents Devante and Drina, brother and sister twins, to investigate a seaside castle. Now is your chance to start one of these wonderful series or get caught up! Maybe you know I have a lot of great stories with Trestle Press? Maybe you know that Trestle Press has no end of talented authors? Did you know right now Trestle Press is doing a Buy One Get One Sale? Mark Miller's One - a spiritual anthology examining True-Life experiences of Authors and their Faith. As the series evolves expect to discover what it means to have faith, no matter what that faith is and no matter where they live. Remember that we are all part of this One World. Volume 5 is coming soon! Small World Global Protection Agency - Another in the Trestle Press Digital Short Story Cliffhanger Series: Star athlete Josh and computer prodigy Madison are recruited by the mysterious Mr. Crux to attend a special summer camp. The two elementary school kids then begin the adventure of a lifetime. 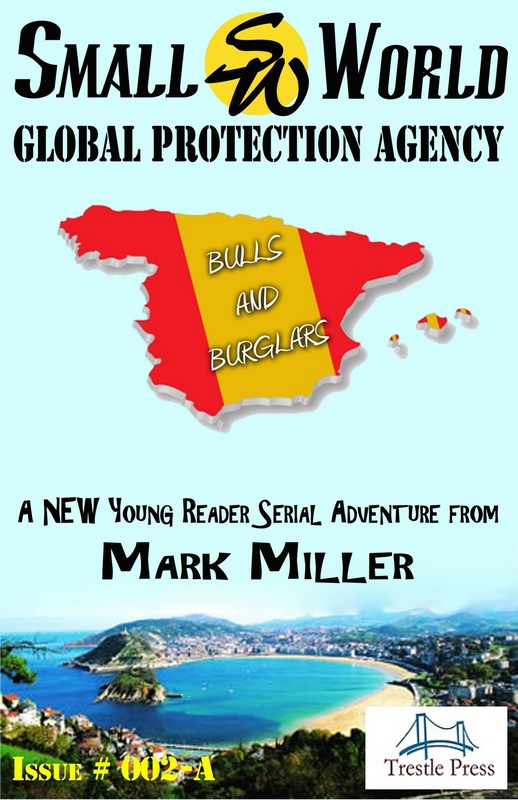 They discover that the Small World Global Protection Agency is a network of talented and skilled children in countries all over the world. Their mission is to help other kids and save the day when adults can’t. Volume 3 is coming soon! 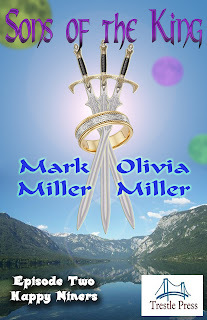 Sons of the King - (co-written with my daughter, Olivia) In the land of Mysstira on the planet Kaskaya, a great King has three sons. When a mysterious visitor falls from the sky, their world is changed forever. The sons of the King will soon face their destiny. BUY ONE TITLE GET ONE TITLE FREE SALE !! All of our titles are part of this sale, all of our authors will be participating in it, and all you have to do is when you purchase one of our stories send us the proof of purchase and we will be happy to send you the title of your choice that is of equal value. -the authors of the titles you purchased and get your free titles directly from them. 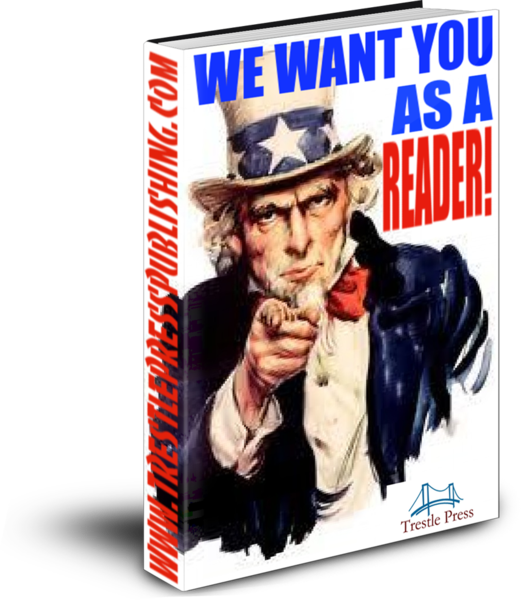 We have a wealth of talented authors at Trestle Press and there are many great stories to discover and read. As the week goes on there will be a few surprises thrown into this sale, so please stay tuned to our website: www.trestlepresspublishing.com or your favorite authors’ websites or blogs. Feel free to follow us at our website for all the upcoming news and events surrounding all of the Trestle Press authors as they create more Best-Selling novels, novellas, short stories and series for you to follow and enjoy. We hope that you will join us and our authors as we make our journey and try to blaze a new trail in this wide open world of publishing. Without you all is for naught; for everything we do, we do for you the reader!